There are a lot of different types of wine openers available today. Most are the common corkscrew and handle, which are fine if you have strong hands and don’t mind a little mess, but sometimes opening a bottle of wine can be quite a struggle. You really don’t want to wrestle with a bottle of wine in fine restaurants, at weddings, or in any other situation where making a mess or making a spectacle out of yourself isn’t an appealing option. For that very reason, the Oster company has created a line of wine bottle openers that takes a step beyond the ordinary wine opener while remaining within a very attractive price range. Before we discuss the products, let’s acquaint ourselves with the brand. The Oster Brand made its humble start in 1924 when John Oster took advantage of an opportunity to bring to market an innovative hand-operated hair clipper. The forward-looking new product was an ideal solution for cutting and styling women’s hair in the fashion of the day. Just four years later, Oster introduced an advanced motor-driven version of the clipper which soon made the Oster Company a manufacturer of choice for households and for professionals in the hair styling and grooming industry. In 1946, Mr. Oster chose to diversify from hair cutting and barber tools to small household electrical appliances. The company then purchased Stevens Electric, the inventor and manufacturer of the liquefier blender, which originally came to market in 1923. Shortly after that, the world’s first Osterizer® Blender was unveiled to the public. The success of this one model paved the way for Oster to build its reputation within the small kitchen appliances industry. As time went on, blenders of increasingly greater blending power began to take over a whole range of food preparation work in kitchens across the country. Menial food prep chores like grating, chopping, grinding, pureeing and more were now being done in Oster’s powerful blenders, rather than by hand. With a wide range of appliances, such as bread makers, mixers, juice extractors, toasters and, of course, wine openers, the Oster company grew to become an emblem of style and quality in the small kitchen appliance industry. In 1960, the John Oster Manufacturing Corporation was purchased and became a subsidiary of Sunbeam. Since then, the Oster company has gone through a great deal of changes in order to keep pace with the market and continue to produce products of excellent quality that look terrific and are useful in any household kitchen. There are a lot of electric wine openers that will work off the shelf and open a bottle of wine with little trouble. However, few will be as feature-rich as an Oster and even fewer will have the lifespan and durability of an Oster. Oster wine openers offer a guarantee of quality with every purchase. Best of all, there are no wine openers in the higher price ranges that do anything an Oster won’t. The Oster wine opener comes with a powerful charging stand, which fits neatly and unassumingly on your kitchen counter. Oster recommends charging it for eight hours after purchase. Each subsequent charge will take no more than two hours for the life of your battery and each charge will uncork thirty bottles of wine. The opener itself is 2 1/4 inches in diameter by 10 3.4 inches tall, featuring an ergonomically designed handle for comfortable use. This item comes with a foil cutting tool, which neatly and safely removes the sealing foil from the top of a bottle of wine. Ordinarily, you would have to use a knife, your fingernails, or some other method of removing the foil. Oster takes away the headache of this annoying task. After removing the foil, all you need to do to open your bottle of wine is place the opener over the cork and press the switch to start the corkscrew. 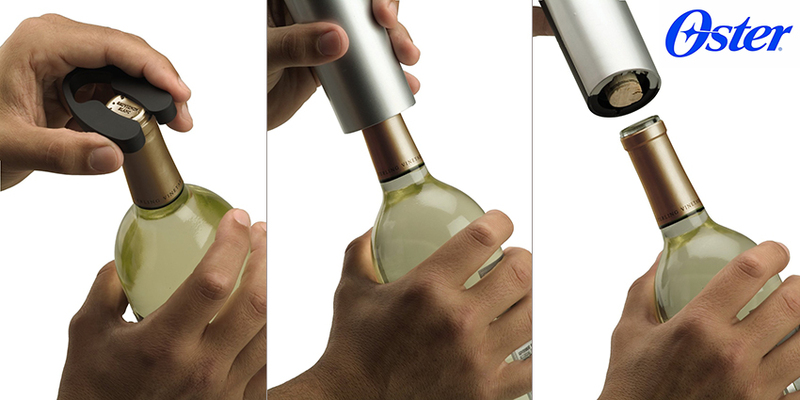 The Oster wine opener does all of the work, slowly pulling the cork right out of the bottle without straining your hands. After the cork has been completely removed, simply press the upper part of the switch to release the cork from the screw. You can customize your Oster wine bottle opener’s color so it matches the rest of your kitchen appliances. These openers are available in Silver, Merlot or Champagne finishes. Is an Oster Wine Bottle Opener Right for You? In keeping with the theme of quality that has been a hallmark of Oster since the company’s inception in the 1920s, this line of electric wine bottle openers represents the finest you can find without reaching for a much more expensive solution to wine bottle opening. These products have earned a reputation for their powerful yet compact motors that remove corks easily and completely. Rarely will you find pulped or shredded bits of cork in your bottle, which, as you know, can adversely affect the taste of your wine. However, don’t just take our word for it. Here is a summary of what customers liked and didn’t like about this product. As you would with any kitchen accessory, you’ll find common benefits and drawbacks when browsing the reviews of Oster wine openers. It is important to weigh the pros against the cons in order to determine if this accessory is the right one for you. There are many things that people love about this product, the number one thing being how long this quality tool will work for you. The Oster wine opener is built to last. Many customers have written positive reports of their wine openers years after they first purchased it. When properly cared for and maintained, this tool should be around to open many bottles of wine. Oster wine openers have powerful motors that can save you the strain and trouble of uncorking your wine. With the simple touch of a button, your wine opener will remove that stubborn cork with little trouble, taking the pain and strain out of your hands. The rocker switch, which activates the corkscrew action, also allows you to easily eject the removed cork from the opener by simply pressing the button in the opposite direction. Many reviewers were more than satisfied with the ease and simplicity of use. While it should be expected that this electrical appliance will need to take up space on your countertop, many people were impressed with how compact the opener and charger were. While docked and charging, this tool can be easily tucked into a corner on your counter so it never gets in your way. Some people complain that the Oster wine opener does not do a good job opening synthetic corked bottles, while others swear they have had no problem. While it may have a slightly more difficult time grabbing the non-genuine type of cork, it just takes a bit more pressure by the operator to use with synthetic corks. Alternatively, you can avoid synthetic corked bottles, or use two hands for easier use. Some say that the cork does not always come out after opening the bottle. This can be easily overcome by using a knife or spoon to hold the cork still so that it comes out, but the vast majority of the time, your cork will come out with no trouble at all. Other reviewers say that the noise of the motor is too loud and grating. If you are in a setting that calls for quiet, then the noise of the opener can be a problem. If you do not feel comfortable with the noise in a given situation, consider pre-opening the bottle or opening it in a different room or area to avoid disrupting your event. There were also a few mixed reviews on the lifespan of these wine openers. Many claim that their wine opener has lasted years and years with little to no wear and tear, but others say that they noticed the tool losing strength after about three months. However, those who were dissatisfied with the lifespan of their Oster wine opener were in the minority. These devices make wonderful gifts for the wine aficionado on your Christmas or birthday gift list. They are also an excellent option for elderly people or those who lack the upper body strength and coordination to open a wine bottle manually. Few wine openers will offer you the same ease of use, elegant body styling, power and durability of the Oster brand. Overall, we believe these wine openers are the best value with the most features and best ease of use when compared to many other brands. If you are a wine lover or love someone who is, these handy and elegant devices should be at the very top of your wish list this year.